This pretty white gold wedding ring is lifted out of the ordinary thanks to the band of sparkling diamonds. The crossover design lends a contemporary twist to this classic ring. 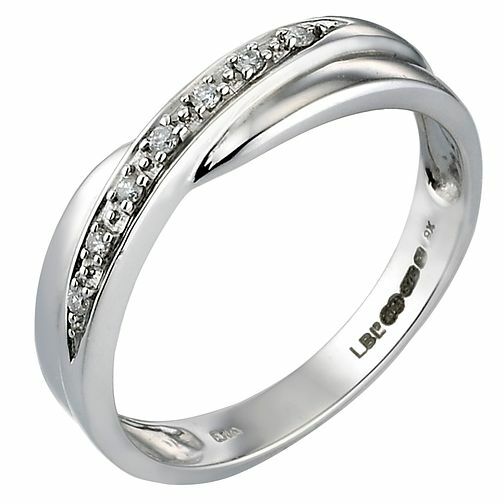 9ct White Gold Diamond Wedding Ring is rated 4.7 out of 5 by 6. Rated 5 out of 5 by Anonymous from This product is outstanding , and great quality This product is fantastic value for the money and very well made. Rated 3 out of 5 by Anonymous from Poor quality band I've only wore this ring fit 2 weeks and it's scratched really badly, so bad I can feel grooves in it and I take it off when I wash up. I only have a desk job so can't understand how it's like this unless it's cheap gold? And I love the design, it would b my perfect ring if not poor quality. And its not as if it was cheap to purchase!